More details on the closure of the San Gabriel River Bike Trail later this month. As we noted yesterday, the pathway will be closed from 2nd Street to Marina Drive in Seal Beach from April 23rd to May 4th, between 9 am and 3 pm, Monday through Friday. In response to an email from Mike Wilkinson, Long Beach Mobility & Healthy Living Programs Officer Michelle Mowery explained LA County is doing a video examination of discharge drains along the lower levee to ensure they’ll work properly during heavy storms. It will require the closure of the entire San Gabriel River path, since the camera/vacuum truck takes up the entire width of the bike trail. No detour will be provided, however, because the west bank of the San Gabriel River is in poor condition and not available for use. This is what it looks like to get cut off by a Metro bus while riding in a DTLA bike lane. Evidently, that small strip of green paint doesn’t work as bus repellant. And yes, the bike rider has the right-of-way in that situation; driver’s are required to wait until the bike lane is clear before moving into it. Spring and Main Streets are scheduled to get protected bike lanes in the coming months, which should keep bus drivers from cutting into them like that. Because nothing else seems to. Today’s common theme is bike tours around the world. A group of Arkansas cyclists say let’s bike to Luckenbach, Texas, with Waylon and Willie and the boys. You can now take the high-speed train under the channel from London to Amsterdam. And yes, with your bike. But do it fast before Brexit screws everything up. The London Telegraph suggests taking a bike tour through Jordan, calling it perhaps the most surprising cycling destination on Earth. A New Zealand newspaper suggests a series of international bike tours that won’t make you feel like you’re riding in the Tour de France. Seriously, they had me at visiting a Scotch whisky distillery in the Inner Hebrides. Maybe we should all move to Wilmington. Councilmember Joe Buscaino — one of the few LA city councilmembers willing to fight for bike safety — is calling for a four to five mile cycle track loop connecting the main features in the port area. CBS News offers a brief report on LA’s pilot program to paint a few streets grey to cool the surface and the surrounding area. Which should make riding more comfortable on hot days if it proves successful. West Hollywood drivers hit a pedestrian and a bike rider two hours and four blocks apart; the bicyclist wasn’t hurt, but no word on the walker. 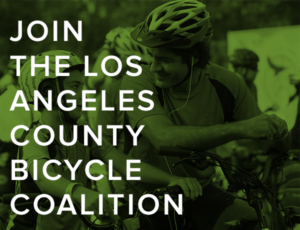 Anti-bike forces strike out in Culver City, as both candidates endorsed by Bike the Vote LA come out ahead. A writer takes an ebike for a spin in El Segundo to determine if they really are the future of transportation. And likes what he feels. A San Diego drunk driver has been ordered to pay his victims just $12,000 in restitution — while their lawyer gets a whopping $218,000. If you’re riding in Goleta today, watch out for a police crackdown on traffic violations that put bike riders at risk, regardless of who commits them. You know the drill; ride to the letter of the law until you’re outside the city limits. A Napa paramedic is taking a bike tour across the US while he still can, to promote laws requiring drivers to move over to pass emergency vehicles. He and his partner were hit by a speeding driver high on meth while they were on a call five years ago; doctors tell him he will probably be paralyzed from his injuries in another few years. Sad news from Lodi, where a salmon cyclist was killed in a crash after reportedly swerving in and out of traffic. No bias here. An appropriately named conservative talk show host goes on an anti-bike rant, asking if cyclists are Seattle’s most selfish commuters, and saying if you don’t like the crappy car-centric conditions, get on a bus. Bike crashes are down in Austin TX, but like everywhere else, bicyclists still face dangers on the streets. Including one woman who barely survived a crash last year, only to be struck a second time by a hit-and-run driver this week. Good idea. A Chicago suburb urges everyone to walk or bike to church or temple during Earth Day weekend. New outdoor stairs in Oakland — no, the one in Pittsburgh — will get a bike ramp to help riders get their bikes up the hill. Sad news from the UK, as a 50-year old cyclist died of a heart attack while competing in a race. A pair of Dutch cities will be connected with the longest heated cycle path in Western Europe to keep the path free from snow, and permit year-round riding. An Indian website catches up with Alexi Grewal, still the only American man to win gold in the Olympic road race. A local paper insists bikeshare can work in Delhi, despite the oppressive heat and air pollution. After a deadly year, New Zealand bicyclists deliver petition to Parliament calling for safer bike infrastructure and lower speed limits. An Aussie paper says it’s time for drivers to show a little respect after a pro cyclist describes how frightened she was to barely escape a close call. Cycling Tips looks at the up-and-down racing career of Tejay van Garderen, once the great young American hope. And suggests all he needs is a little luck. Cycling Tips also profiles little known Aussie climber Alex Evans, who’s joining his Continental team for a block of races in the US. Good question. A German website remembers a number of pro cyclists who’ve died of heart attacks, with Begian rider Michael Goolaerts just the latest in a long list. And asks why so many are dying. Twenty-four-year old Swiss cyclist Stefan Küng left Paris-Roubaix with a broken jaw suffered in a crash, and will be out six weeks following surgery. As usual, safety tips for bicyclists, but none for the people in the big, dangerous machines. Don’t bother with evidence, just take the driver’s word. And when finishing dead last shows as much heart as winning. Streetsblog editor Joe Linton was kept out of a Metro meeting to discuss the East San Fernando Valley Transit Corridor Project until he agreed to throw his “dangerous” multi-tool and wrenches into the trash. And was told he could fish them out after the meeting — after one of the security officers dumped coffee into it. Just another sign of how bike riders are treated in this city. Never mind how easy it would have been for someone, anyone, to agree to hold them for him until he came back out. Or just how stupid it is to talk about encouraging bicycling, while actively discouraging bicyclists. And never mind the kneejerk opposition he found to including bikes in the project once he finally got inside the Metro meeting. Lyft envisions a redesigned Wilshire Blvd that reduces the street’s 10 spacious lanes down to just three narrow one, along with dedicated bus lanes, to show what life could be like in a world of shared, self-driving vehicles. 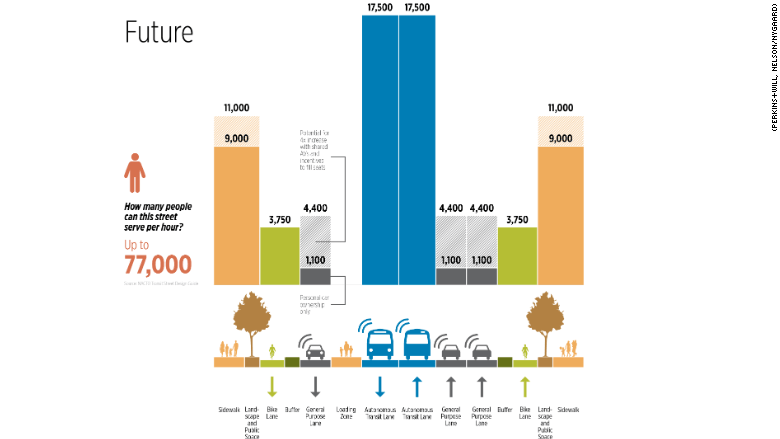 The plan also includes wider, park-like sidewalks and protected bike lanes. The company says the narrowed street could accommodate twice as many road users and carry four times as many people as it currently does. No word on whether the forces attempting to roll back road diets in Mar Vista and Playa del Rey plan to recall the president of Lyft or file suit to stop the concept while it’s still in the vaporware stage. A report on KABC-790 radio says evacuees fleeing the La Tuna fire earlier this month were delayed due to traffic jams caused by the road diets on Foothill Blvd. Although it’s surprising they would have been so surprised by changes that were made five months ago. Three-time US Olympic track cyclist Sarah Hammer retired at age 34, ending a career that began with her first junior title 22 years ago. Next year’s Giro d’Italia will start just a little outside the country in the ancient Roman suburb called Jerusalem. It’s official. Scottish cyclist Mark Beaumont rode around the world in less than 80 days, finishing in 78 days, 14 hours and 40 minutes — smashing the previous record by 44 days. A memorial was unveiled in the English hometown of fallen cyclist Tom Simpson to mark the 50th anniversary of his death on the slopes of Mont Ventoux during the 1967 Tour de France. An Op-Ed in the LA Times calls the cars the third rail of California politics, saying people will revolt if you slow them down or make driving more expensive. Which, as we’ve seen recently, is all too true. Pasadena’s Art Center in planning a bikeway inspired by the historic California Cycleway to connect its separated campuses. Parisian haute couture menswear brand Berluti has opened in Beverly Hills, with a made-to-order bespoke bicycle among the shop’s offerings. Simon Cowell is one of us, as he goes bike riding with his family in the former Biking Black Hole of Beverly Hills, which is finally starting to show some promise. Curbed calls the Marvin Braude Bike Path through Santa Monica LA’s most beautiful bike path, even though the Santa Monica section is actually in… wait for it… Santa Monica. I’ve heard the beachfront bike path called many things in my many years here, but never The Strand. 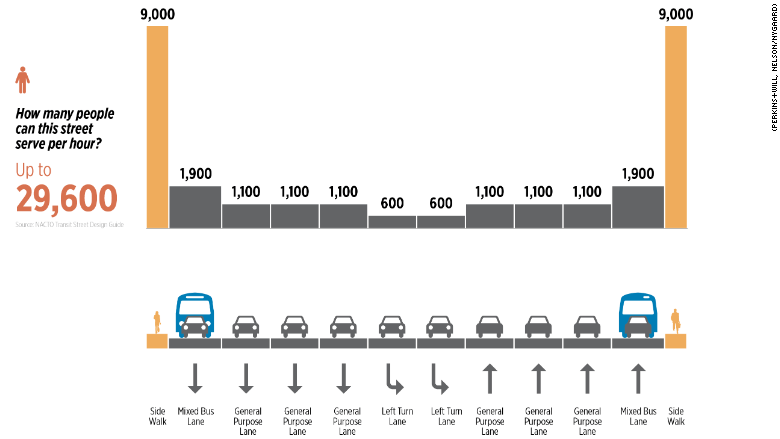 The South Bay’s Easy Reader News looks at the controversy over Vista del Mar and the Playa del Rey lane reductions, albeit from a mostly windshield perspective. Long Beach police are looking for a bike-riding scumbag who’s been exposing himself to underage girls. UberEats will now be delivering some of their food orders by bicycle in San Diego. This is why you shouldn’t chase a bike thief yourself. A pair of Visalia men nearly got shot by a bike thief after they chased him down when they saw him take a bike from their garage. The International Cycling Safety Conference in Davis will explore how smart city technology can help make urban areas more bicycle friendly. A homeless Redding woman was stabbed by another homeless woman following an argument as the victim was riding along a canal. Eureka police are looking for a fleeing DUI suspect who hijacked a woman’s bike at gunpoint, before trading down by jacking a car as he rode her bike through a mall parking lot. Bicycling talks with cyclists who credit their helmets with saving their skulls. Seattle permanently removed a traffic lane on a downtown street to make room for protected bike lanes. Despite mixed opinions, no politicians appear to have been recalled and no one’s filed suit to stop it yet, unlike a certain SoCal city we could name. Bicycle Retailer says this week’s Interbike show in Las Vegas is still the best way for smaller brands to get noticed. A popular Colorado man was found shot and killed three days after he disappeared while on a bike ride this past Thursday; police are treating the case as a homicide. Counter protesters interrupted a press conference by a New York state legislator who wants to halt plans to install a protected bike lane on a deadly Queens boulevard. A new study shows triathletes face twice the risk of dropping dead during a competition as marathon runners, with the greatest risk occurring during the swimming leg of the race. Brakeless fixie-rider Charlie Alliston has been sentenced to 18 months after being convicted of wanton and furious driving for killing a London woman as she was crossing the street. Thanks to Allyson Vought and John McBrearty for the heads-up. Caught on video: Nothing like a little no-hands dab and dance while riding on a British street. British bike historian Carlton Reid examines why the country’s most bike-friendly urban design failed to encourage bicycling; short answer, they made it too easy to drive. Bicycling deaths and serious injuries are down 20% since UK police began an undercover operation to catch drivers passing too close to bicyclists. Maybe that will convince the LAPD to finally give it a try. Edinburgh and Glasgow, Scotland, will receive the equivalent of nearly $30 million dollars to convert their city centers to bike-friendly mini-Hollands. German police are looking for a cyclist who interfered with rescue personnel to film a dying motorcyclist, rather than offering assistance before paramedics arrived as the law requires. Seriously, WTF is wrong with some people? An Australian news site looks at what happens in the aftermath of a bicycling collision, including the obvious observation that it’s always the person on the bike who loses. Aussie authorities blame tourists using GPS devices for a crash that injured a bike rider. So naturally, social media blames the people on two wheels. Caught on video two: A dog sits upright in the saddle behind a bike-riding girl in an undisclosed Asian country, with its paws wrapped around her waist like a child trying to hold on. Who needs motor doping when you can just fire up the afterburners. Or maybe just let hurricane-force winds give you a gentle little nudge. And now you, too, can own your very own Beastie. Unless you’d rather ride a bike made of whisky casks. Southern California’s killer highway has claimed another victim. And a lack of bicycle infrastructure may be at least partially to blame. According to the Daily Breeze, a 13-year old girl, who has not been publicly identified, was riding her bike with a friend when she somehow swerved in front of, or into, a Metro bus around 5:40 pm on Pacific Coast Highway at Knob Hill Ave in Redondo Beach. The paper reports a witness said she swerved in front of the bus, while initial reports suggest she rode into the side of the bus, according to a Metro spokesperson. The bus was operated by a subcontractor, MV Transportation, rather than Metro itself. However, the South Bay’s Easy Reader, which places the time of the crash as 4:40 pm, cites a local business owner who says the girls were coasting their bicycles along the sidewalk before riding out into traffic. They also note that the collision was partially captured on security camera, while observing that the bus had the green light as it approached Knob Hill on southbound PCH. The other girl was unharmed. A street view shows a commercial roadway on PCH with two lanes in each direction and a center left turn lane, with a wide sidewalk along side. Meanwhile, a Twitter photo on the KTLA-5 report shows the victim’s bike resting on the curb on the northwest corner, while police blockade the center Knob Hill alongside PCH, suggesting she may have ridden off the handicapped ramp into the intersection. However, it’s unclear how that would have placed her in the path of the bus. The lack of safe bicycling infrastructure on PCH may have contributed to the crash by encouraging the girls to ride on the sidewalk instead of the street, where they would have been more visible to the driver. And may not have had to dart into the path of the bus. 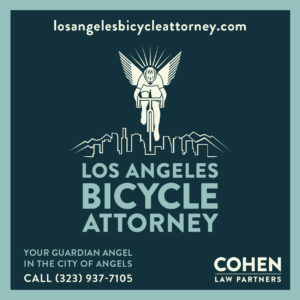 This is the 17th bicycling fatality in Southern California this year, and the 10th in Los Angeles County. And while it’s at least the fifth bicycling fatality in Redondo Beach since 2010, it’s the first in the last five years. Update: The victim has been identified as 13-year old Ciara Smith of Redondo Beach, a student at Parras Middle School. Update 2: The community turns out to mourn her death. Update 3: KCBS-2 reports the crash may have been a result of misaligned crosswalks due to the single diagonal cut handicap ramp, rather than two separate ramps aligned with the crosswalk. Some of her classmates brought flowers and wore bright clothes in her favorite colors of teal, mint green and blue. My deepest sympathy and prayers for Ciara Smith and all her family and loved ones. This one’s worth a listen. The Cycle Feed podcast talks with our own Dorothy Wong, who walked away from Hollywood to become one of SoCal’s leading bike race organizers, and the driving force behind SoCal Cross. And while we’re recognizing successful LA women, Grist honors LADOT’s Rubina Ghazarian and Metro’s Avital Shavit as part of the Grist 50 for their work getting LA on two wheels with the new Metro Bike bikeshare program. The 2017 Tour de Fat schedule has been announced, with 33 stops throughout the US for the annual beer and bike festival. But if you live in the LA area and want to attend, you’ll have to travel at least 120 miles, as they’re apparently avoiding Los Angeles like the plague. They’re making four California stops, with the closest one in San Diego on July 8th. Not to mention two in the Bay Area. Seriously, was it something we said? 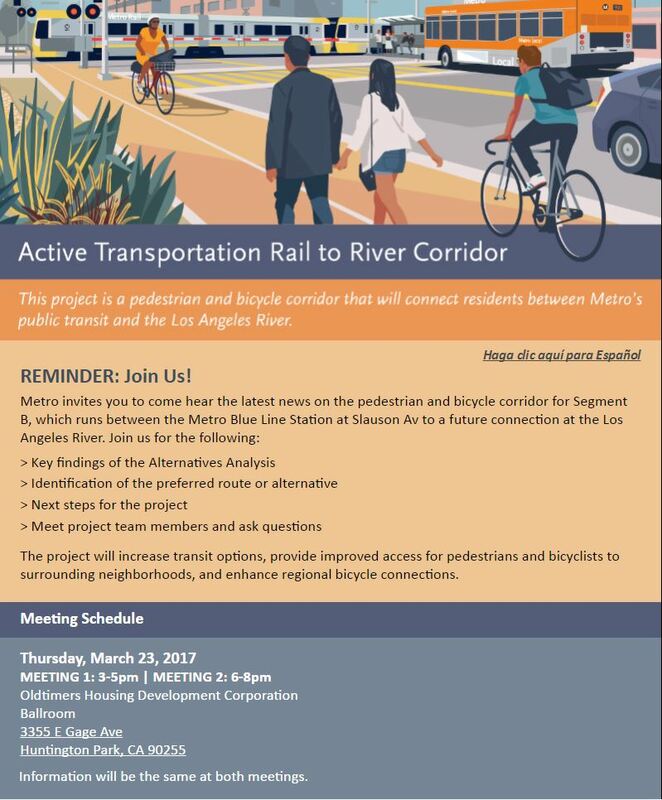 There will be a meeting in Huntington Park tomorrow to discuss plans for the awkwardly named Active Transportation Rail to River Corridor. USA Cycling announces a new 12-race American Road Calendar; the only California race in the series will take place in San Dimas this weekend. On the women’s side, USA Cycling has set a goal of becoming the number one women’s cycling nation in the world. But if they fail, they’ll probably feel like number two. The head sprint coach for British Cycling makes an emotional appeal for organ donors as he discusses the liver transplant that saved his life. I’ve signed my donor card, though I’m not sure anyone would want my used parts anymore. A 50-year old bike rider suffered unspecified injuries when he allegedly turned left into the path of a BMW in Glendale Friday afternoon; police concluded the victim was at fault. Let’s hope that’s based on something other than the statement of the driver involved. 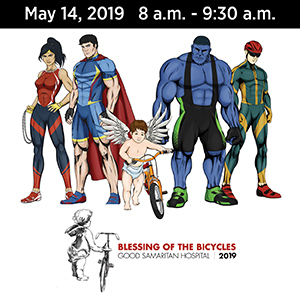 Damien Newton talks with Monica Curiel of Bike SGV about the bike and pedestrian count planned for April 1st; volunteers are needed throughout the San Gabriel Valley. The Long Beach Grand Prix course opens to the non-motorized public for a brief time next Tuesday with a mini Beach Streets-style ciclovía. 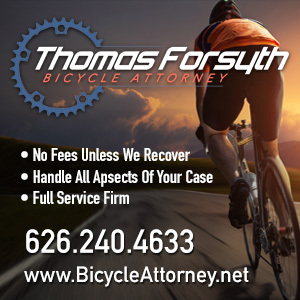 Jason Roy Rocha was charged with gross vehicular manslaughter, evading police and hit and run with permanent injury after fleeing the Sunday morning crash that killed Encarnacion Salazar Munoz as he rode his bike home from work in Anaheim. The OC DA takes traffic crimes like this very seriously; with a little luck, Mr. Rocha can look forward to a long time behind bars. The recent $4.85 million settlement with a man who was injured while riding his bike on the sidewalk could lead to changes in how San Diego sidewalks are maintained. Ventura County gets $3.3 million in grants for three active transportation projects. The San Luis Obispo paper calls on SLO County to spend the money to add another 4.4 miles a popular bike trail. More bad news from NorCal, where a man on a bike was killed in collision in West San Jose; no details are available. Al Williams fills in some of the details, reporting the crash occurred near his home on a four lane street with bike lanes and a 35 mph speed limit; he says there was a Porsche with a broken windshield stopped on the side of the road when he went by. San Francisco gets new ferry boats with room for 50 bikes. And a lot of people, too. No, really. Scofflaw cyclists don’t break the law more than anyone else. PlacesForBikes Michael Andersen asks if women riders are really more risk averse, or just more honest about admitting their fears. The Robb Report shares a first-person view of one of their staff members wiping out on an ebike. Repeatedly. Bicycling seems to have a bit of a donut obsession lately. The Idaho mountain biker who was shot and killed by police last week for threatening dog owners with a gun on a local trail was well known and liked at the local bike co-op. A Montana physician says the bike-hating senator who wants to ban bicycles from state highways is wrong. My hometown newspaper looks at the pain grieving families feel over the light sentences given killer drivers. And tips are running out in the investigation into a series of apparently random shootings in the area two years ago that took the life of a popular cyclist, along with another man. The stoned driver who killed five cyclists in the Kalamazoo massacre will reportedly plead insanity. A Wisconsin man purchased a billboard to ask drivers to watch for cyclists in memory of his wife, who was killed while riding a year ago today. New York is getting more serious about Vision Zero, as the city gets ready to break ground on safety improvement projects throughout the five boroughs, including more protected bike lanes. DC could soon pay commuters to leave their cars at home. California has a similar law allowing employers who subsidize parking to offer employees the chance to cash-out their parking space and take alternative transportation instead. A Charlotte NC cop only realizes he hit a salmon cyclist when saw his broken side mirror. But if he never saw the victim, how did he know he was riding the wrong way? In another North Carolina crash involving law enforcement, a bike rider was killed in a collision with a state police officer after allegedly running a red light, while the driver was only doing 23 mph. Funny how it always seems to be the other guy’s fault when a cop gets in a crash. Bike Radar asks if a new series of mixtes from Brit bikewear maker Vulpine are the ultimate urban bikes. Sad news from Costa Rica, where the fourth victim of a hit-and-run driver has died, seven weeks after her riding companions were killed at the scene; the driver turned himself in only after police discovered his car. Caught on video: An English bike rider comes to blows with a driver who reportedly blocked his path. Seriously, drivers can be jerks, but violence only makes a bad situation worse. A London bike rider is on trial for beating a man to death with his bike lock, when he and his friends followed the victim after a dispute in a chicken stand. The strongman president of Turkmenistan is one of us, too. A former South African rugby player got seriously banged up in a solo fall. Trucks hauling dirt from a Melbourne rail tunnel currently under construction will be fitted with protective sideguards to protect bicyclists. Sideguards have been proven to improve safety and save lives; all commercial trucks should be required to have them installed, including here in the US. Apparently there’s nowhere that cyclists can ride without some people complaining. Like the Aussie rider who was assaulted by a man who told him to “cycle on the road” — while he was riding in a velodrome. Yes, a velodrome. Fortune says China’s app-based bikeshare model doesn’t make any sense, despite the investor funds that are pouring in. Yes, it looks beautiful, but how does it ride? If you’re going to rob a gas station with a toy gun, try not to ride your bike into a pole when you make your getaway. And here’s your chance to catch up on the best bike vs animal videos, including the infamous zombie kangaroo herd. Metro wants your input on their proposed budget for the 2018 fiscal year. 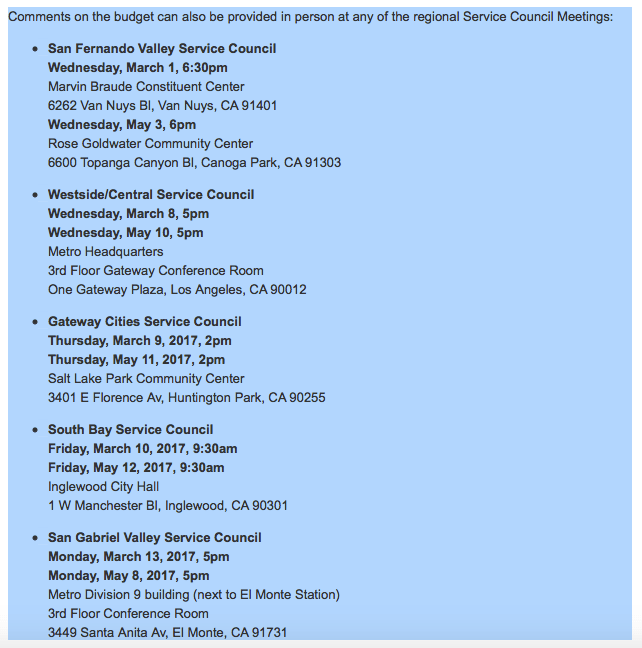 You can respond online or in person at any of the meetings below. And be sure to rank Active Transportation at the top of your priority list. Which hopefully means more than just running to catch the bus that’s leaving without you. West Hollywood unveils its draft Pedestrian and Bicycle Mobility Plan, which promises to deliver real networks for bicycling and walking. Now you, too, can make your pancakes like the pros do. An entire Iranian cycling team gets banned after two of its riders test positive for steroids. Just like sidewalk cyclists in cities around the world, pro cyclists Peter Sagan, Greg Van Avermaet and Sep Vanmarcke could face a fine. They should do their racing in Los Angeles, where riding on the sidewalk is legal. And despite Sagan’s example, a mouthful of candy probably isn’t the best way to refuel on your ride. KPCC looks at the CD1 city council race between embattled incumbent Gil Cedillo and four challengers, most notably our own Joe Bray-Ali. This month’s LACBC Sunday Funday ride will be a feeder ride from Highland Park to the 626 Golden Streets event. Metro unveils the locations of Pasadena’s coming bikeshare system. Fresno releases their $1.3 billion Active Transportation Plan, despite not building out the city’s previous plans. Not unlike the languishing plans found most cities, where new bike and pedestrian plans are usually forgotten as soon as they’re written. A San Francisco bike rider was the victim of a violent mugging when someone whacked him with a crowbar and stole his bike. One more reason to always wear a helmet. Oddly, if you fail to remove parking meters from the curb next to a raised San Francisco bike lane, drivers will continue to park there. Caught on video: A Sacramento cyclist is lucky to be alive when his back wheel is clipped by a speeding train after riding onto a railroad crossing. No word on whether he rode through the barriers, or even if the crossing had crossing arms or warning lights. Security video was posted online that shows the fatal shooting of a bike rider in Redding last month; the driver claims it was self defense, though the victim may have been reacting to a near collision. Schwinn invites you to relive your childhood with a new limited edition Lemon Peeler Stingray. Mountain bike legend Gary Fisher says e-mountain bikes are the next big thing, because they remove all the work and just leave the fun. Which kind of takes the fun out of it. Like pretty much anything else from Ikea, their new bike requires some assembly, but Fast Co-Exist says you’ll have a very rideable urban bike when you’re done. This is the cost of traffic violence. One of the nation’s leading experts on bioterrorism was killed in a collision when he was collateral damage in a wreck between two cars in St. Louis. Friends of a killer Minnesota driver blame a possible undiagnosed brain tumor instead of intoxication for the crash that took the life of a runner in a crosswalk. CNBC talks with MIT physicist Assaf Biderman, maker of the Copenhagen Wheel, which promises to turn nearly any bike into an ebike. A New York driver cuts a teenage bike rider off as he rides on a sidewalk, then blames him for getting mad. A New Orleans writer calls Mardi Gras a gateway drug that turns people on to the possibility of two-wheeled transportation because it’s the most efficient way to get around during carnival season. Bike-riding medics protect the crowd at the Mobile AL Mardi Gras celebration. The family of a fallen British bicyclist call for reforming the country’s sentencing laws after the driver who killed him cops a plea for a reduced sentence. Britain could cut serious bicycling collisions by a third just through better enforcement of safe passing laws. A British man decides he needs a change, and bikes 9,000 miles from his hometown to South Africa, while expecting to get jumped by a lion along the way. The leading Dutch bikeway engineering guide gets an update, showcasing the country’s best bike practices. Which means the best practices, period. Five German woman have been attacked by an acid-throwing bike rider since December. If at first you fail to hit a cop with a bicycle, try throwing a tricycle. Is it still a three state challenge if there’s only two? And if you’re going to flee from a failed break-in, remember to take your bike with you.